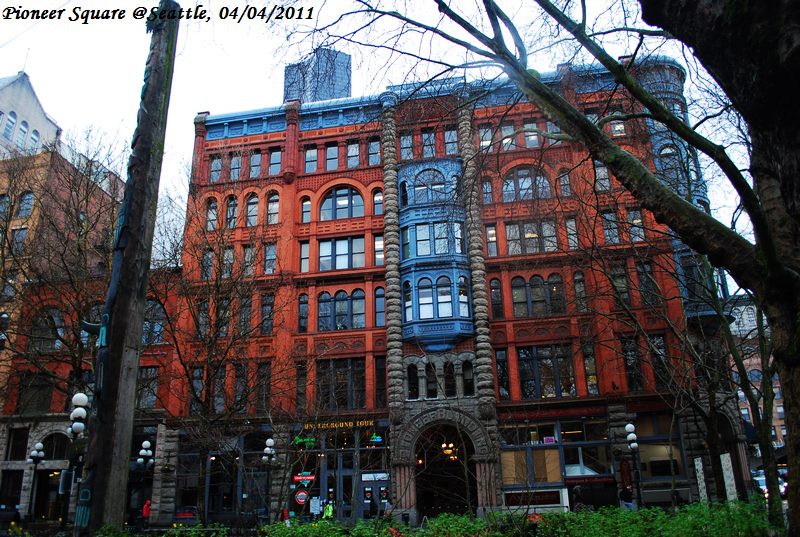 This is my first time visiting Pioneer Square. Surprisingly I found, the drizzle today by no means ruins the trip as it always does, but turns out to be perfect for a place so full of history. 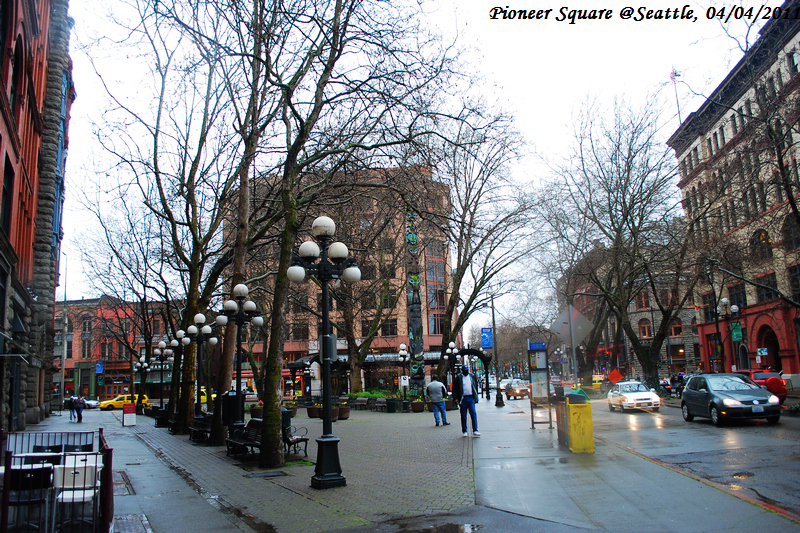 The square is literally a triangle neighborhood roughly bordered by 1st Ave and Yesler Way in downtown Seattle, much smaller than I ever assumed. Although surrounded by transportation, the plaza stands aloof from the buzz, quietly telling people the origin of the city. 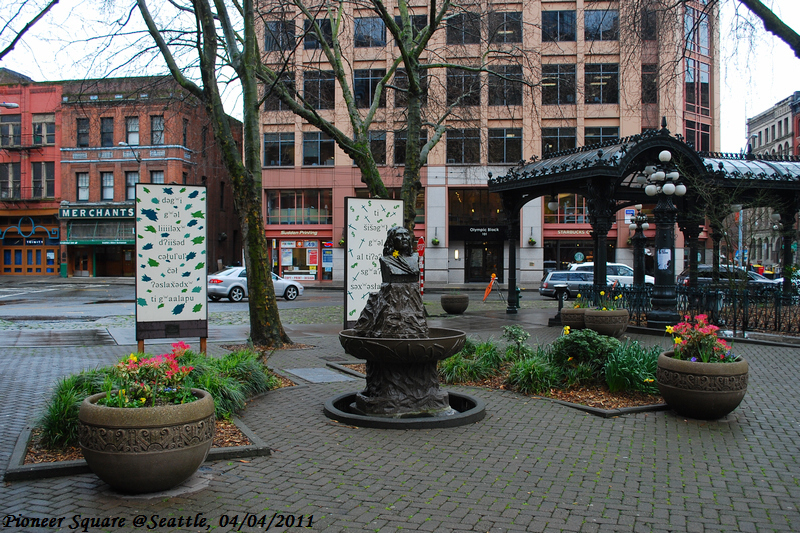 Nothing sophisticated in decoration, the square only has three eye catchers in the heart, the iron pergola, the Totem Pole, and the statue of Chief Seattle. My favorite is the iron pergola. Born in Suzhou China, a city well known for its classical gardens, pergola’s never been a novelty for me. But this one in Pioneer Square is different in flavor, very occident-style. Its structure is simple but with ornamental engraving all over the coping and columns. After years of exposure, traces of rust on the pergola are still visible while the original color is hard to identify. It looks like celadon, but much darker. 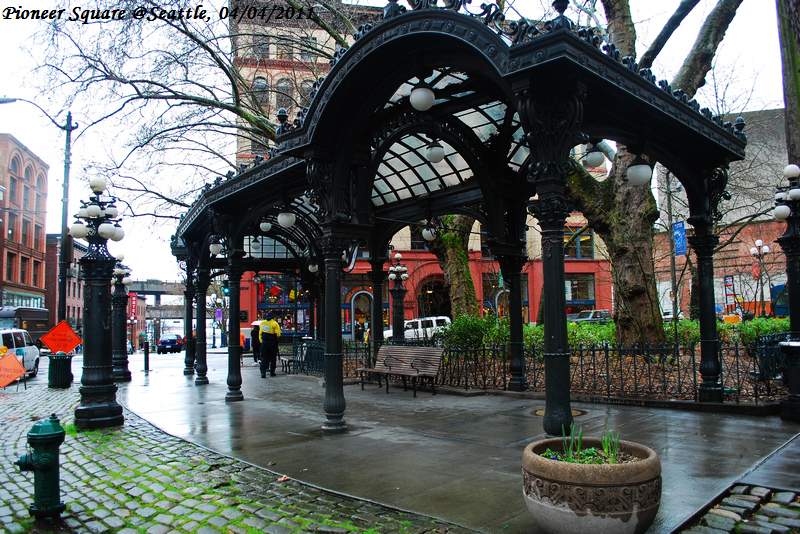 As the sign introduces, the pergola was erected in 1909 as a waiting shelter. But I think the style is more recreational, which now makes it quite a good public rest place for visitors and passers-by. Sitting inside and looking up, I notice the fade leaves flying down on the glass vaulting roof, accompanied by the raindrops tapping. This is a little desolate, but the elegance of aging is not discounted. 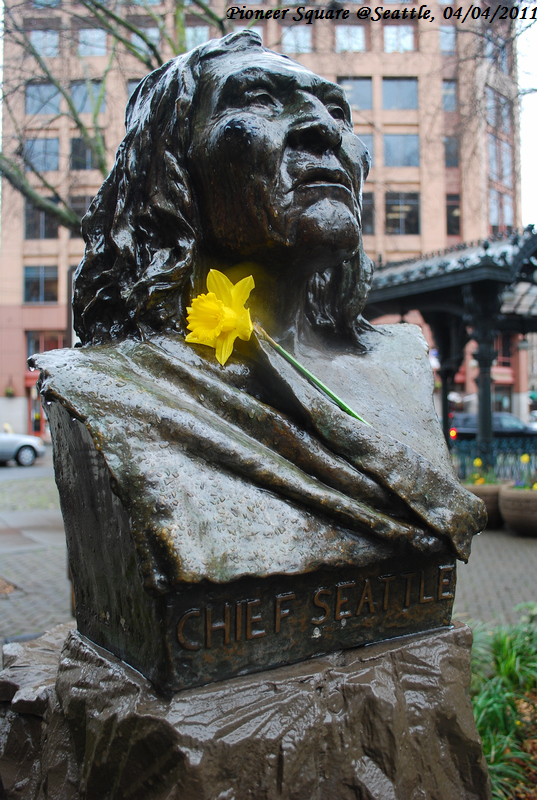 Right beside the pergola stands the copper statue of Chief Seattle. I can still sense the authority on his weathered face. He is the pioneer, who explored the city and made it home for us. It’s meaningful to place him in this spot where Seattle was established, so this man can witness the growth of the city and his descendent. Someone puts a yellow flower on his chest, the bright color of which gives a lovely shine to this cool statue. 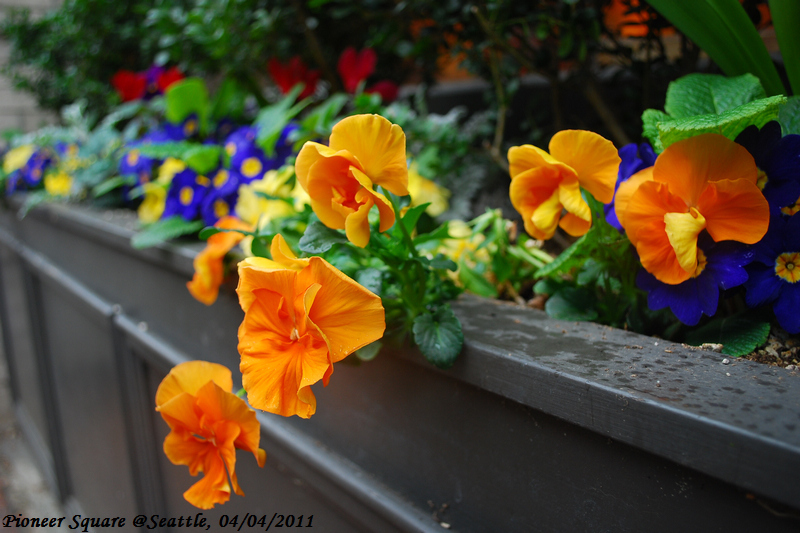 Yes, the flowers are things that stand out in the gray environment. Several parterres are put in the center, easing the heaviness brought by history. 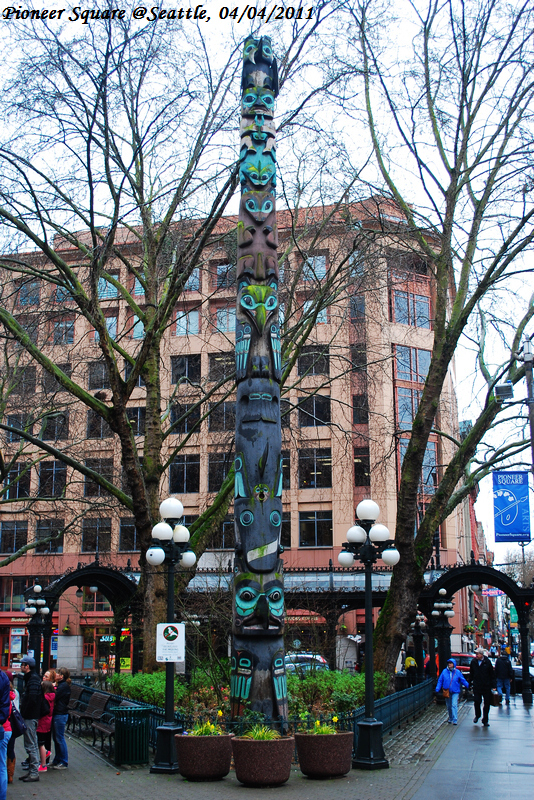 Comparing to the iron pergola, the Totem Pole acts more like a landmark in the square. The pole is estimated over 10 meters. 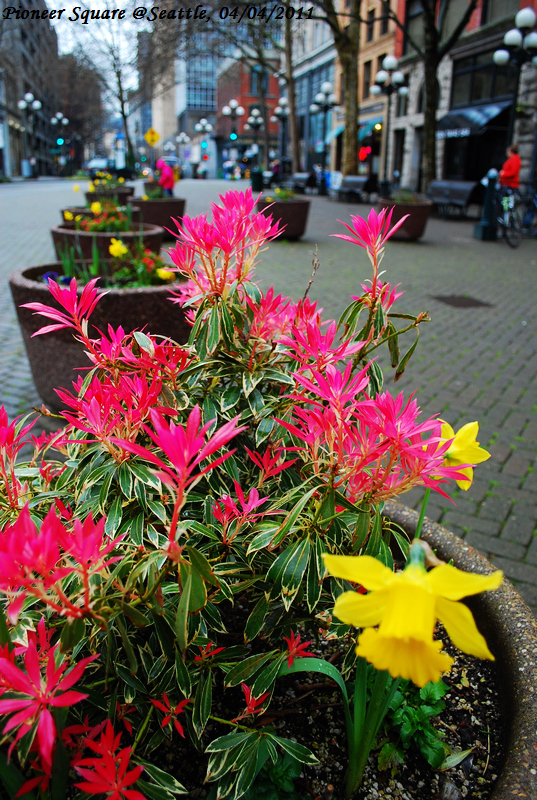 The height makes it overwhelm other sceneries in the square. 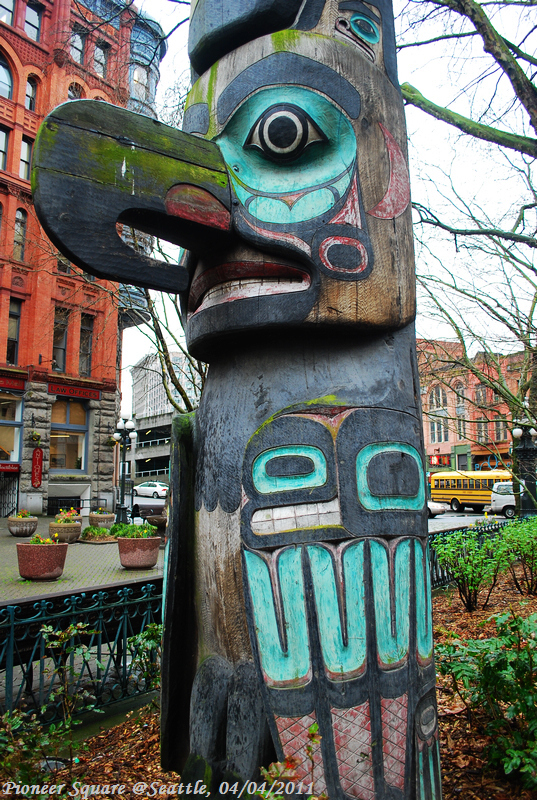 Like most of the totems that I’ve seen in the Seattle Art Museum, there are faces of eagle, wolf, and dog carved on it. The paint of green, red and black on the pole are fading, some even with lichen adhered. Though I know Totem Pole was rebuilt in 1930s, it still creates an indelible aura of mystery from remote antiquity. Not only the pergola and totem, there are other elements that add history to this area, like the buildings around. I am not sure about the style of the architecture, but they look old and arty. Most of them have their first floor renovated as art galleries or stores selling exquisite gifts. There are not so many visitors in the square today. Ravens and pigeons fly past and stop on the ground sometimes. A group of downtown ambassadors in yellow coat go on an inspection tour here between times to see whether people need direction guide. One man named Mark from the group tells me that Pioneer Square was once a street, but people living in this neighborhood prefer it to be a square. Why not? 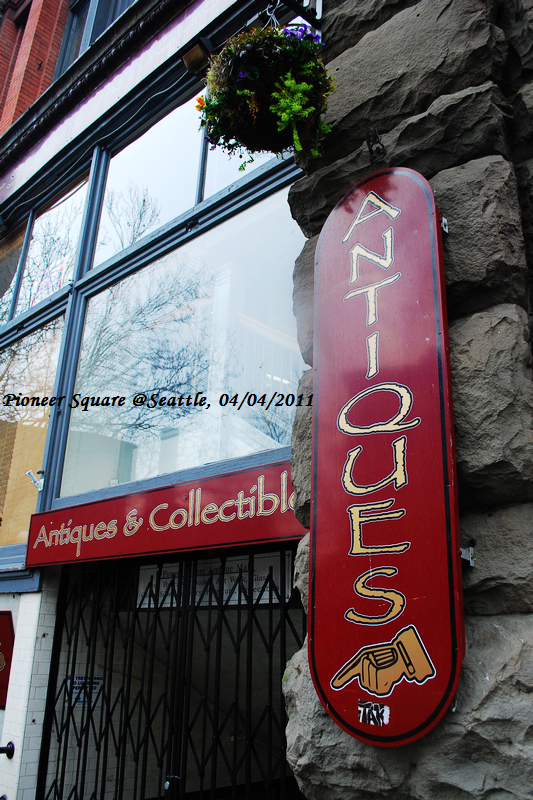 This unique place filled with the smell from Seattle’s past transports people who have been living amidst the bustle and hustle of the modern big city to a world full of antiquity, leisure and tranquility. This entry was posted in life in USA. Bookmark the permalink.